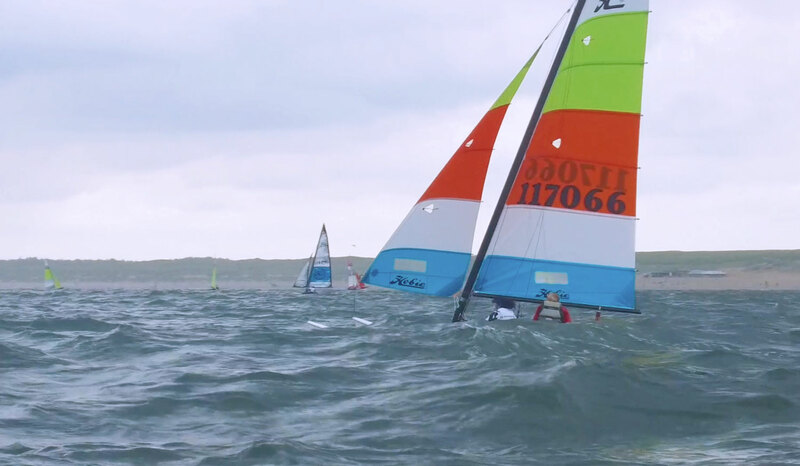 Hobie 16 European qualifiers 70 boats racing. The day after the grand award ceremonies for the Hobie 14 and Dragoon World Championships and Hobie 16 Master, Grand Masters, Youth spi, and spi European Championships . What a party it was. For sure we inspired the Formula 1 on how to celebrate with the amount of champagne sprayed from the podium winners! On Monday the wind and surf had calmed down. Light air, again from Westerly directions. A rainbow formed over the Holland Hobie House, a beautiful welcome to the early bird sailors arriving at the beach. At the scheduled starting time for the first race the wind shifted to onshore and picked up nicely to around 8 – 10 knots, making sailing possible. The dark thunder clouds blew past and did not come back. 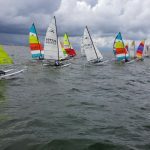 Day 5 and halfway through the Hobie 2017 Multiworlds & Europeans, four races were sailed for the Hobie 16 Open qualifiers. This is for the sailors that did not qualify for the Hobie 16 Open Gold Fleet. 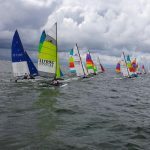 Today and tomorrow the sailors will battle in a fierce competition on the course for the prestigious Hobie 16 Gold Fleet, and which will race in the -almost as good- Silver Fleet, starting on Wednesday. The fleet was spit in two and raced and scored separately. 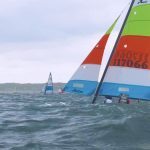 In the yellow fleet former Hobie 14 World Champion Thorin, Zeilmaker had an impressive day with three ist places and a fourth. When asked about the fourth Thorin replied, ‘I had the lead but thought it was only 2 laps. So I started t head for the finish line when I say the fleet heading back upwind. So I stopped and headed back upwind but I had already lost eight places’. 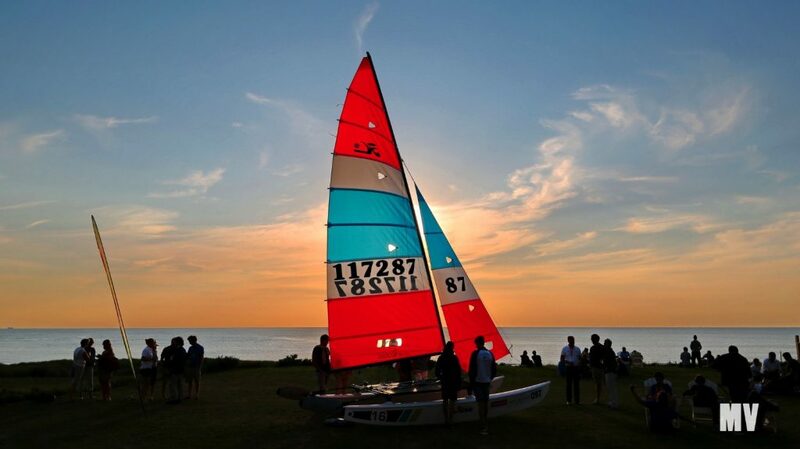 Tomorrow the forecast is tailor made for spectacular Hobie 16 sailing: ~ 20 knots from the North / Northwest, with winds going up to 25 knots in the late afternoon. 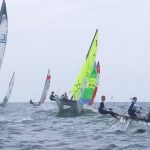 A large swell greeted the Hobie 16 sailors wishing to qualifying for the Hobie 16 Gold Fleet and the chance to win the Hobie 16 European Championships. The leading boats will be allowed to enter the Gold Fleet with the sailors who have qualified in their own country. Many of the sailors decided it best not to leave the beach with the swell and shore break. Those that did venture had four races in 15-20 knots of breeze and excellent surfing conditions. 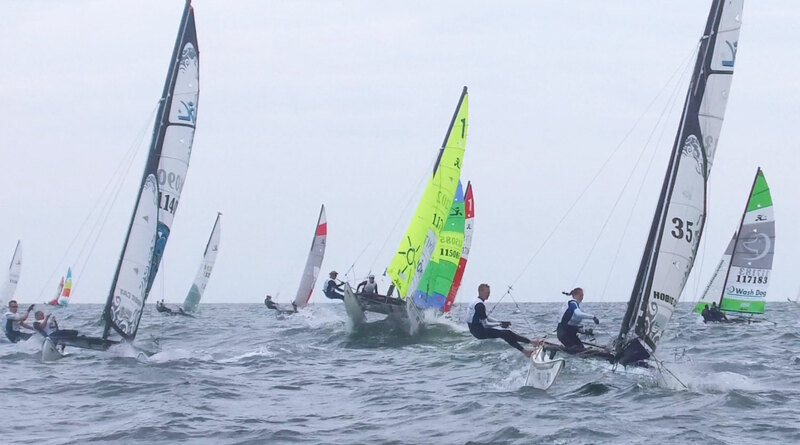 Many of the sailors did only 3 races as they had done enough to qualify for the Gold Fleet. Thos close to the ‘cut off’ and one or tow others enjoyed the conditions they sailed the 4th race of the day. Tomorrow the fleet will be split with the Gold Fleet sailors receiving brand new mainsail and jib with battens from Hobie Cat Europe. 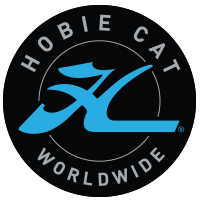 Also joining the Hobie 16 fleet with be the Hobie Tiger and Hobie Wild Cat. The Wild Cat will be a world Championships where current world champion Mitch Booth will be sailing with his daughter Rita.